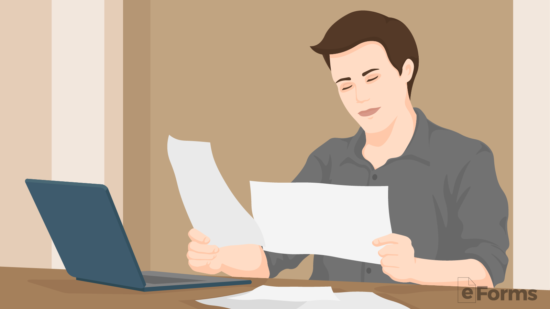 Power of attorney forms are legal documents completed by an individual (the “Principal”) to appoint someone else to act on their behalf (the “Agent” or “Attorney-in-Fact”). The Agent may be able to handle financial, medical, guardianship, or tax-related matters. If the form is durable, this means the Agent will be able to continue to act on the Principal’s behalf if can go no longer make decisions for themselves. Which is common in the elderly. Signing – The forms are required to be authorized in accordance with their State laws. Durable (Financial) Power of Attorney – The most common type of power of attorney, allows a person to grant someone else the unrestricted ability to handle financial transactions on behalf of the principal. General (Financial) Power of Attorney – Grants the same financial powers listed in the durable form except that it does not remain in effect if the principal becomes incapacitated or mentally disabled. IRS Power of Attorney (Form 2848) – Revised in Dec. 2015, allows an individual or business entity to elect a party, usually an accountant or tax attorney, to file federal taxes on their behalf. Limited Power of Attorney – Permits a person to carry out a specific activity on the principal’s behalf either as a one (1) time occurrence or for a specific period of time. Medical (Health Care) Power of Attorney – Used by an individual to select someone to handle their health care decisions in the chance they are not able to do so on their own. Minor Child Power of Attorney – Allows a parent to give the full responsibility of their son or daughter to someone else (except adoption rights). Valid for a temporary period of time, usually between six (6) months to one (1) year, which is dependent on the State’s laws. Real Estate Power of Attorney – For a buyer or seller of property that would like to hand over their rights in relation to handling the negotiation and transaction at closing. Revocation of Power of Attorney – To cancel a current power of attorney arrangement. State Tax Filing Power of Attorney – Used to elect a tax preparer to handle a filing on behalf of an individual or entity. May be used for State or Federal filings. Vehicle Power of Attorney – Typically provided by a State’s Department of Motor Vehicles (DMV) or related agency to allow another person to sell, register, or title an automobile. A Power of Attorney is the act of allowing another individual to take action and make decisions on your behalf. When an individual wants to allow another person or entity to make decisions on their behalf, a power of attorney (POA) is used. If you allow someone to act on your behalf, you are the “Principal“. The person or entity acting on your behalf is known as the “Agent“. Obtaining a Power of Attorney (form) is easy, all you need to do is decide which type of form best suits your needs. With our resources, creating a power of attorney no longer requires hiring an expensive attorney to draft your document. Download our free power of attorney or create your document online with us. View and read the Form Types in order to get a better understanding of which form(s) are best for you. The most common is the Durable Power of Attorney for Financial purposes which allows someone else to handle any monetary or business related matter to your benefit. In addition, if you would like to elect someone to handle your medical needs as well you can elect a health care agent with the Medical Power of Attorney to make any and all decisions in the chance that you are not able to do so for yourself. A full list of documents that an individual may want to complete are located in the Estate Planning Checklists which are specific to each State. An Agent, also known as an Attorney-in-Fact, is the individual that will be making the important decisions on your behalf. This individual does not need to be an attorney, although an attorney can be your agent. The two (2) most important qualities you should look for in your agent is accountability and trust. You want to be sure that your agent will be available during times of duress and faithfully execute your wishes. It is possible to list more than one agent in your power of attorney form in the event your primary agent falls ill or is unavailable when needed. After you have decided on the form(s) needed it is time to sit down and fill in the document. Most forms are provided by the State and can easily be filled-in via PDF format (Download Adobe PDF Reader). The Agent(s) should be present at the time of writing the form and all personal information of the Principal and Agent(s) should be entered. It is required to have the form(s) be signed in the presence of Witness(es), a Notary Public, or both. Check the laws in your State and only until after the document is properly witnessed will it be eligible for use. For Medical Power of Attorney, some hospitals require that originals be present so it is recommended that originals be given to all Agents. After the form(s) are signed it will be up to the Principal and the Agent(s) to properly store them for when they are needed for use. These forms are not filed with any government agency or office so it will be up to each individual to securely maintain the form until it is needed. A Power of Attorney and the powers granted to the Agent ends when the Principal either dies or becomes mentally incapacitated. If you select to use a Durable Power of Attorney, the powers you give to your Agent will remain in effect if and when you become incapacitated. Since one of the primary reasons to have a power of attorney is to make sure someone is there to make decisions on your behalf if and when you can’t make them for yourself, it’s a very popular choice to have a power of attorney be durable especially when the powers are medically related. Agent(s) and Principal must sign the document. As witnesses, two non-family members or a notary public (some states require both) need to sign. Because you acting in the place of the Principal, you need to first enter the Principal’s name followed by your name which then needs to be followed by the words “attorney-in-fact”. This allows everyone involved know that you are the Principal’s Agent. Q: When to use a power of attorney? A: People most frequently use a power of attorney for financial or healthcare reasons. Say you want someone to act on your behalf for when you fall ill in the future, you would use a Medical (Health Care) Power of Attorney so your Agent could make health care decisions on your behalf. If you are in a rare situation and want to give specific powers that aren’t financially or medically related, you can create a Limited (Special) Power of Attorney. 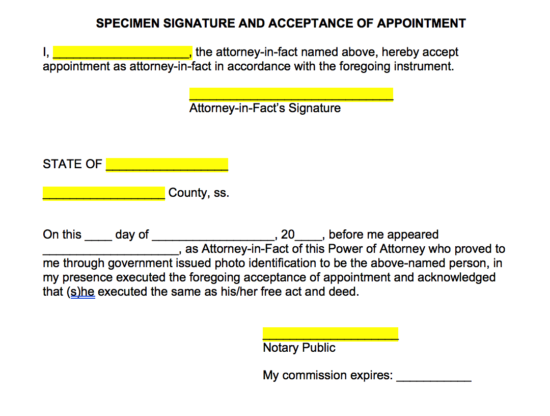 Q: Does a Power of Attorney have to be notarized? A: Many people think that you need to submit your power of attorney with the government however that is incorrect. Many states require that your power of attorney be notarized to ensure that the signatures are true, which is to help detour fraud. Only the Principal needs to be present with the notary for the Power of Attorney to be notarized. You can find a notary at any banking or financial institution. The easiest way is to go to a banking institution that you are associated with, as they will usually do it for free. The last step is to make a copy of the power of attorney and give it to your Agent and keep the original with you in a safe place. 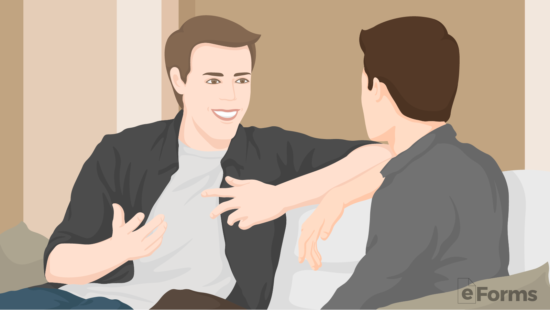 Q: What should I do if my parent lives in another State? A: The power of attorney must be tailored for the state in which your parent resides. It does not matter which state you live in, as long as the power of attorney is applicable to the Principal’s state of residence, which in this case is your parent, is what matters. 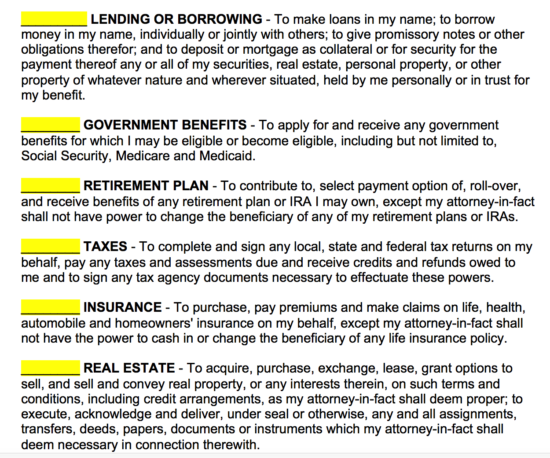 Q: How to change/remove Power of Attorney? A: Normally, by creating a new power of attorney that addresses the same powers as your previous power of attorney, it will automatically revoke your previous power of attorney form. It’s important that you notify all individuals and institutions of the change. 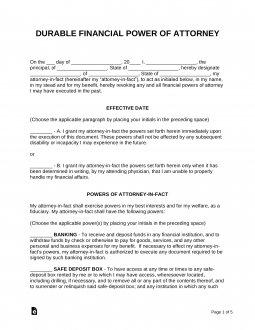 Complete and sign this Revocation of Power of Attorney Form in order to remove your current power of attorney. 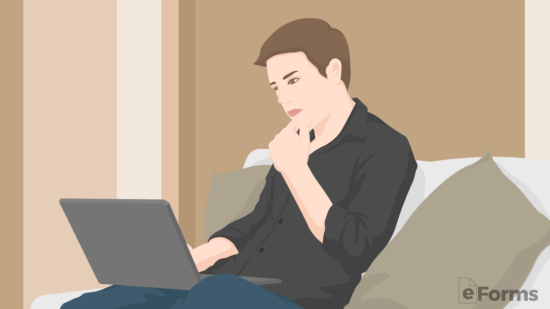 Q: Can a Power of Attorney change a Will? A: The only person that has the power to change a Will is the person that created it. Therefore, there isn’t any kind of power of attorney that will allow an Agent to change or modify the Principal’s Will. 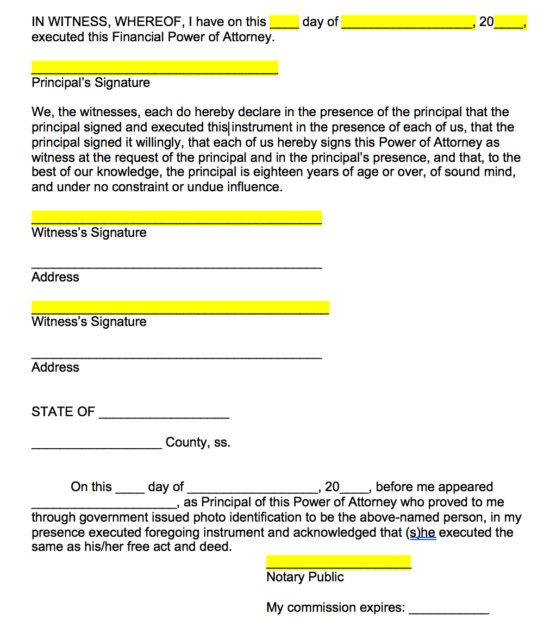 Before the Principal writes this form they should keep in mind that the Agent (or ‘Attorney-in-Fact’) will need to be present at the time of signature along with signing in the presence of a notary public or two (2) witnesses (depending on the State). Step 2 – The Effective Date should be entered by the Principal placing their initials whether they want the document to begin immediately or to begin when a licensed physician has deemed the Principal to be incapacitated (this is also known as a “Springing Power of Attorney”). Safe Deposit Boxes – This allows the Agent to have access to any safe deposit box that the Principal has possession or control of. Even if the Agent was not granted a key to the box, as long as it is in the control of the Principal the Agent may have access to it by any means possible (i.e. drilling or accessing through alternative methods). Lending or Borrowing – The Agent shall obtain the right to make loans under the name of the Principal and to the Principal’s best interest. It is recommended that all loans made be completed with security (Secured Promissory Note) as to protect the financial status of the Principal. Government Benefits – The Agent will have full control over the handling of all government assistance including but not limited to Social Security, Medicare, and Medicaid. Retirement Plans – If the Principal owns any IRA’s, 401(k)’s, or any other retirement plans with benefits that the Agent may have the vested power to alter or withdraw any funds from the account they deem to be to the best interest of the Principal. Taxes – Such as every United States citizen has the obligation to pay local, State, and Federal taxes, this allows the Agent to file for the Principal. 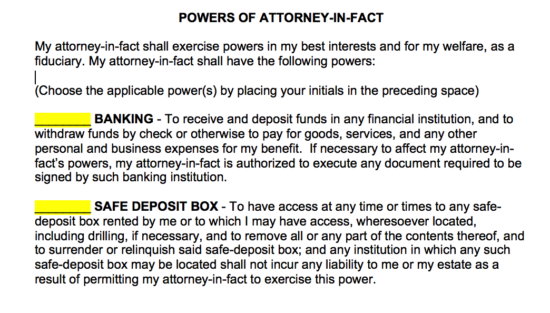 Most likely a copy of this power of attorney will be needed to be attached to all filings made. Insurance – Any type of Auto, Home, or Life insurance maybe changed, accepted, or discontinued by the Agent in the chance he or she deems it as a benefit to the Principal. Real Estate – All property that the Principal has an ownership interest in shall be at the disposal of the Agent. In short, this means that any property the Principal has ownership in can be sold or leased by the Agent. Personal Property – The Agent shall have the right to acquire, purchase, exchange, lease, or sell any type of personal item. This means that the Agent can use the funds by the Principal to purchase a necessary item or sell assets that the Agent’s deems to be in the Principal’s best interest. Power to Manage Property – If the Principal has a house, apartment building, or commercial property the Agent has the right to sign leases or otherwise manage the premises (such as placing a home or residence on Airbnb for short-term rentals. Gifts – Making gifts to others on behalf of the Principal is a major legal liability although it is allowed in most States. This is something that the Agent should be very careful about doing as if the Principal becomes incapacitated with death imminent in the near-future the Probate Court, after the Principal passes away, may claim the gifts were unauthorized or illegal transfers of assets. Legal Advice and Proceedings – If the Principal is currently involved in any type of litigation or in need of legal help the Agent may make decisions as best to handle the said legal proceedings. 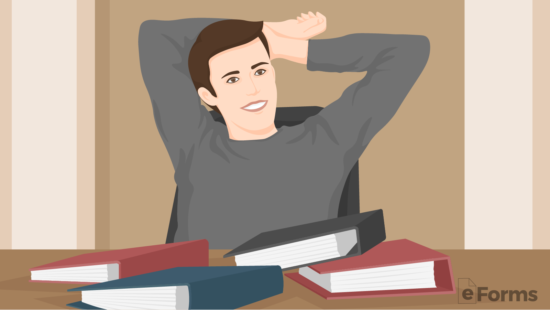 Special Instructions – If the Principal has any other powers they wish to place in the hands of the Agent that were not already mentioned it should be listed in this area and initialed by the Principal. 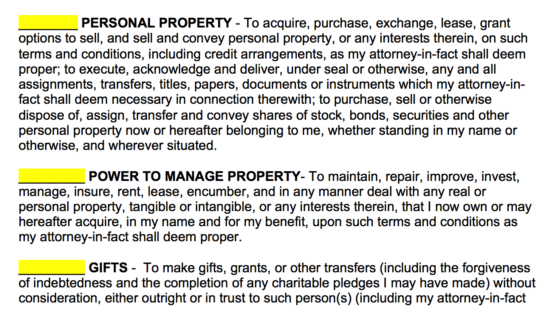 Step 4 – The Agent and Principal must sign the document. Their signatures must either be witnessed by two (2) non-family members (or related by marriage) or a notary public (or in some States, both). Step 5 – Most States require that the Agent sign an Acceptance Form authorizing that they know the powers being vested in them by the Principal and that they agree to always make decisions to the best interest and benefit of the Principal.